Golfers competing in the 2015 Big Ten Men’s Golf Championship warm up on the morning of the first round at the practice range of Victoria National. With the Big 10 Championship one week, the Web.com Tour visiting the next, Indiana’s Victoria National maximizes plant health to get the course dialed-in and ready. A-one, a-two, a-three. Just how many licks does it take to get to the bottom of a practice bunker? The Big 10 men seem determined to find out. It’s late April in Southern Indiana and golfers are milling about the practice range like ants. Every one of them is dressed in his school colors (Penn State, Ohio State, Michigan State, Nebraska, Rutgers, Minnesota, Purdue, Wisconsin — is this the Big 10 Championship or a GCSAA Turf Bowl?) Shot after shot on the range, putt after putt on the practice green, it’s the definition of a busy golf course. Victoria National Superintendent Kyle Callahan drives by on his Gator and admires all the activity. A four-leaf clover on his hat, he’s not above hoping Lady Luck is on his side these next two weeks. Immediately following the Big 10 Championship (eventually won by Illinois) is the Web.com Tour’s United Leasing Championship. Back-to-back tournaments are no easy feat; just ask the crew at Pinehurst No. 2. While this comparison lacks the mammoth crowds, stadium seating and TV towers of a U.S. Open, it does offer its own unique challenges in its early season timing, cool season turf and unpredictable weather. But with a determined team and the right program, Callahan believes anything is possible. 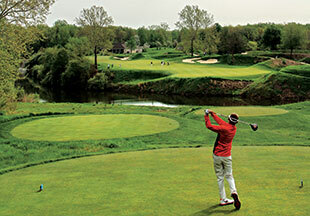 Victoria National Golf Club, located in Newburgh, Ind., was built in 1998 by Tom Fazio and the late Terry Friedman. Friedman, the owner, and Fazio, the architect, had as their canvas an old coal strip mine, abandoned in 1977. Friedman wanted to make something special in his hometown. Special it is. 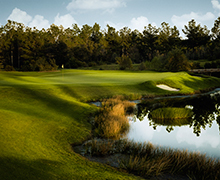 Upon opening in 1999 it was named America’s best new private course by Golf Digest. Some of the course’s luster did wear off since it was named Golf Digest’s No. 21 course in America in 2005. Falling to No. 45 is nothing to be ashamed of, but it was the desire of the new owners (Friedman passed in 2004) to get the course back to its top-25 ranking — or maybe even better. He did want to be a top-100 superintendent — so he went there. In fact, he moved wherever he thought he should to get the best experience, including three moves in 10 months when he went from spray technician under Latshaw at Muirfield Village GC in Dublin, Ohio, to assistant superintendent at the Club at Carlton Woods in The Woodlands, Texas, to first assistant at Crooked Stick GC in Carmel, Ind. And so, apparently, does his staff. Callahan, 32, has been at the course for a little more than a year, but he’s hired seven staffers since arriving — all kids younger than him and cut from the same cloth. The saying Callahan uses is ‘Different roles, similar goals.’ Ask any of the crew what the goal is, and they all know it by heart — it’s getting the course back into the top 25. And, oh, yeah… surviving these two stressful weeks in spring of 2015. “If you can grow grass here in southern Indiana, you can about grow grass anywhere,” Callahan says. Victoria National’s greens, fairways and tees are bentgrass. The rough is a mix of Kentucky bluegrass and fescue. Many of the courses in the area have switched to zoysia. 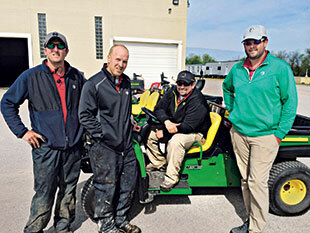 Victoria National’s cool-season turf in its transition zone locale makes things interesting for Callahan and his crew. The different challenges offered at “The Vic” also appeal to the crew, eager to learn anything and everything about maintaining turf at its highest level. Not that the team at Victoria National doesn’t appreciate the Big 10 Championship, but they realize what that means for their course: More than 70 kids — guys even younger than the crew — hitting three shots into every green. Then follow that up with more than 150 Web.com players getting practice in Monday through Wednesday before their tournament starts. Callahan and Assistant Superintendent Gerald Smith say they couldn’t get through it all without plant health. Smith credits the tournament being moved up in the year, from June to May, especially considering the bentgrass. But he agrees that plant health is key. (L to R) Seth English, irrigation technician, Nate Herman, senior assistant, Kyle Callahan, superintendent and Aaron Deloof, spray technician at the start of their two-week journey. Odds are that Callahan met some new disciples among those volunteers — young guys driven to make it to the top of the profession. For those who want to join him on this journey, be ready. Callahan says he doesn’t really care who the person is or where they came from. When they get to Victoria National, they just need to be ready to buy in to the program, be ready to learn and be ready to work.